-To join the TORn Cosplay group, simply email me at Garfeimao@TheOneRing.net to RSVP for everyone in your group, and then follow the below instructions on when and where to meet up. You can also stop by our booth #519/521 to sign up on Thursday. -The parade is on July 4th at 8:30 am. – We will start staging at 7:30 am. Please arrive as close to 7:30 am as possible. I will be dressed as Bilbo after the spider fight (think cobwebs), so find me to check with me, and then I will check in for the whole group. – If you are a walking group, you MUST be in the staging area by 8:10 am. 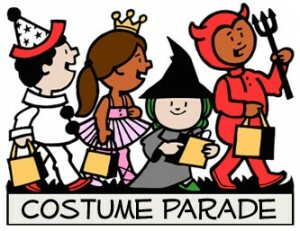 *If you are not in the staging area by the allotted time, you will NOT be able to participate in the parade! – You will only be allowed to drive up/down 50 North until 8:00 am. – The staging will take place in the North-West corner of the parking lot on the corner of 50 North and 500 West. Check-in will be at the staging area. Please send ONE person to check-in as soon as every member of your group has arrived in the staging area. Again, find me in this staging area (look for other denizens of Middle-earth) and then I will check in for the group at 8am sharp. Our group number is 27 and there will be roller skaters behind us. – Every member who participates in the parade will be receiving one (1) free one-day pass for Friday, July 4th. You will receive them at the parade check-in. **When marching, please keep 2 – 3 car lengths between your group and the group in front of you. Please also be aware that we have many varying groups that will be on roller blades, bicycles, motorcycles, cars, trucks, buses, etc. that many need additional space to do tricks or performances. Please see the FantasyCon parade webpage for a map of the location. If you are confused, or need any help the day of the parade, find someone in a FantasyCon volunteer t-shirt. They will be more than happy to provide any needed assistance.